Utah is one of the Western United States and is an absolute highlight of any trip if you are into landscapes, national parks and outdoor activities. Winters are great for skiing up north around Salt Lake City, while the parks in the southern half of the state are great year-round, though spring and autumn are the best times to avoid either cold or hot conditions and crowds in winter and summer. Utah is one of the Four Corners states, and is bordered by Idaho in the north, Wyoming in the north and east; by Colorado in the east; at a single point by New Mexico to the southeast; by Arizona in the south; and by Nevada in the west. It covers an area of 219,890 km2, making it the 13th largest state in the US. The state is one of only three U.S. states (with Colorado and Wyoming) that have only lines of latitude and longitude for boundaries. Utah is known for its natural diversity and is home to features ranging from arid deserts with sand dunes to thriving pine forests in mountain valleys. It is a rugged and geographically diverse state that is located at the convergence of three distinct geological regions: the Rocky Mountains, the Great Basin, and the Colorado Plateau. One of Utah's defining characteristics is the variety of its terrain. Running down the northern center of the state is the Wasatch Range, which rises to heights of about 3,700 metres above sea level. In the northeastern section of the state, running east to west, are the Uinta Mountains, which rise to heights of 3,950 metres or more. The highest point in the state, Kings Peak, at 4,123 metres, lies within the Uinta Mountains. Western Utah is mostly arid desert with a basin and range topography. Small mountain ranges and rugged terrain punctuate the landscape. The Bonneville Salt Flats are an exception, being comparatively flat as a result of once forming the bed of ancient Lake Bonneville. Great Salt Lake, Utah Lake, Sevier Lake, and Rush Lake are all remnants of this ancient freshwater lake, which once covered most of the eastern Great Basin. West of the Great Salt Lake, stretching to the Nevada border, lies the arid Great Salt Lake Desert. Southwestern Utah is the lowest and hottest spot in Utah. It is known as Utah's Dixie because early settlers were able to grow some cotton there. Beaverdam Wash in far southwestern Utah is the lowest point in the state, at 600 metres. The northernmost portion of the Mojave Desert is also located in this area. Vernal - the largest town in the northeastern corner of the state. The place to stay for Dinosaur National Monument, Flaming Gorge and the eastern Uinta Mountains. Arches National Park: the name says it all. This national park, located in southeastern Utah boasts the highest density of rock arches anywhere on this planet: over 2,500 in an area of just about 116 square miles. While some of them might be just a few feet, others like the Landscape Arch stretches over 300 feet (almost 100 metres). Combined with magnificent rock-desert landscape and snowcapped peaks (at least in winter) in the background, it doesn't come as a surprise that this is one of the most favorite parks in the southwest of the USA and also a favorite place for movie makers! Although there probably will be arches forever, arches do come and go under the constant process of erosion - the influence of water and wind, freezing temperatures at night and hot days. Bryce Canyon National Park is one of the natural highlights of any visit to the southwest of the USA. Located in the southwest of Utah, this park attracts many visitors inspired by the natural beauty of its famous hoodoos, spires created out of the bigger rocks they once were. The park is open all year round, with most of the crowds visiting during the warmer summer months from May to September. For a more tranquil visit, come in winter, when the 'hoodoos' are sometimes covered with a thin layer of snow. The Rim Road Scenic Drive is 18 miles long with many turnouts and beautiful views. Most of them are on the east side of the road. 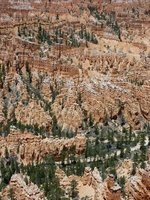 The Bryce Amphitheater stretches from Bryce Point to Sunrise Point where hoodoos form a great landscape. Sunset and Inspiration point are other highlights. There are dozens of hikes to get closer to the hoodoos, down from the main road. The easiest one is the 0.5 to 5.5-mile-long Rim Trail. Others include the 1-mile Bristlecone Loop, Mossy Cave Trail, Navajo Loop Trail, Queen's Garden Trail, Fairyland Trail and Peekaboo Trail. 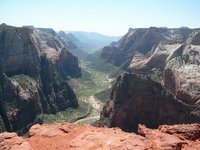 Backcountry hikes include the 23-mile Under-the-Rim Trail, which can be broken into several day hikes. Capitol Reef National Park is a United States National Park, in south-central Utah. It is 160 kilometres long but fairly narrow. The park, established in 1971, preserves 978.95 km2 and is open all year, although May through September are the most popular months. During this tim the park offers several ranger programs at no charge. These include talks, evening programs at the campground amphitheater and occasional astronomy programs. The park is especially popular amongst hikers, as there are dozens of trails, from easy to strenuous. Check the visitor center for details. It is divided into three districts not connected by roads interior to the park: the Island in the Sky, the Needles, and the Maze (including Horseshoe Canyon). The Island in the Sky offers sweeping vistas over the lower two districts; the Needles and the Maze are more rugged, backcountry districts that offer excellent backcountry hikes and camping. Red-rock canyon walls, sandy beaches, deep blue water and an always stunning night sky. Lake Powell, straddling the border of Utah and Arizona, is no-doubt a magical destination. Power boats and wave runners zip about while houseboats slowly wend their way deep into side canyons. The second largest man-made lake in the United States attracts nearly 3 million visitors annualy. Lake Powell is 186 miles (about 300 kilometres) long and has 1,960 miles (over 3,000 kilometres) of shoreline, which is longer than the entire west coast of the continental United States. There are 96 major canyons to explore though you'll need a water craft for the majority of them since access is limited because there are few roads. Glen Canyon Nation Recreation Area, established by Congress in 1972, is the home of Lake Powell. The area is comprised of 1.25 million acres with the lake occupying only 13%, or 161,390 acres, of the total area, which leaves a lot to be explored by four-wheel drive or on foot. Monument Valley is located in the south of Utah and north of Arizona and once approaching it, you will instantly recognize it from many movies, commercials and other things you saw somewhere at least. The landscape surrouding it is, unlike much of southern Utah or northern Arizona actually, rather uninspiring, even a bit drab. It's a rather flat nondescript landscape, but turn around the corner and you suddenly in a totally different environment of rocks, walls and spires towering about the dry desert. Zion National Park is one of the highlights of any visit to Utah. It's located in the southwestern corner of the state, not far from the states of Arizona and Nevada. Bryce Canyon National Park is just about 130 kilometres to the east. 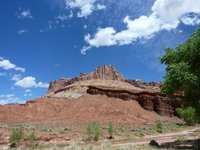 Together with many other national parks in Utah and northern Arizona, it forms part of a great road trip across the sparsely populated southwest of the United States. Although many say it's less spectacular compared to Bryce Canyon, it's a park with fantastic natural features, including the 24-kilometre-long Zion Canyon, dropping up to half a mile down from its rim. The red and white cliffs tower high above the Virgin River. Other features include rocks, grottoes, hanging gardens, waterfalls, lush riverbanks and meadows. Combined with lower elevation, which means warmer days (and nights), it's totally different from many other parks in the drier east. Pioneer Day/July 24th - This is a state holiday and many businesses and shops may be closed. It commemorates the day that Brigham Young arrived in the Salt Lake Valley in 1847 at the head of the Mormon Pioneers thus beginning the white settlement of the area. There is a huge parade in downtown Salt Lake City, along with other events such as the Day's of '47 Rodeo and smaller festivities may be held in other locations. If you aren't downtown watching the parade then you may be out on a lake waterskiing or up in the canyons barbecuing. 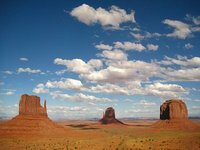 Utah features a dry, semi-arid to desert climate, although its many mountains feature a large variety of climates. Utah's temperatures are extreme, with cold temperatures in winter due to its elevation, and very hot summers statewide (with the exception of mountain areas and high mountain valleys). Utah is usually protected from major blasts of cold air by mountains lying north and east of the state, although major Arctic blasts can occasionally reach the state. Average January high temperatures range from around -1 °C in some northern valleys to almost 13 °C in St. George, but temperatures can drop way below -20 °C in many places as well. In July, average highs range from about 29 °C to 38 °C. However, the low humidity and high elevation typically leads to large temperature variations, leading to cool nights most summer days. The record high temperature in Utah was 48 °C and the record low was -56 °C in a remote area but in inhabitead areas the record -45 °C in Woodruff. Salt Lake City International Airport (IATA: SLC, ICAO: KSLC, FAA LID: SLC) is the major airport in Utah and is located several miles west of downtown Salt Lake City. It handles over 20 million passengers a year. It is a hub for Delta Airlines which along with its domestic flights offers non-stop flights to Mexico City, Toronto, London, Amsterdam and Paris. The California Zephyr, operated by Amtrak, travels between Chicago and Emeryville (San Francisco), stopping en route in a number of places in Utah, including Salt Lake City. Utah can easily be reached along many sealed roads, including several of the main Interstates. The I-15 runs from Las Vegas through a small part of Arizona into Utah and north towards Idaho. The I-70 runs towards Colorado, while the I-80 runs between Nevada and Wyoming through the northern part of the state. The I-15 and I-80 connect near Salt Lake City. Greyhound offers a wide range of bus connections to and from Utah. Salt Lake Express has connections to some places that Greyhound does not. The American Discovery Trail connects Utah with Nevada, Colorado, and both coasts. The Great Western Trail goes north and south mostly along the mountains. Public transportation is basically non-existent except in the Salt Lake metro area. In order to see the many features of Southern Utah a car is necessary. Utah has a number of National Scenic Byways which offer a great way to explore the state crossing beautiful landscapes. Mostly, there are lots of national parks, state parks or monuments along the way and it's generally a better alternative than the faster but boring Interstate Highways. Otherwise, those Interstates are the fastest way to cross the state. North-south by using I-15 from Idaho to Las Vegas and east-west via the I-80 from southern Wyoming to northern Nevada and on to California. Nearly every city in Utah is laid out on a grid system, a vision of the original Mormon settlers. They generally feature wide roads, with a numbering system consisting of intervals of 100 originating from a central point (for example, heading north from the center, the first road will be 100 North, then 200 North, and so on). This system can be confusing for first-time visitors, but is easy to pick up and familiarize yourself with. The major exception to this is Ogden, which was settled as a non-Mormon railroad town and therefore possesses a different numbering system. The Utah Transit Authority (UTA) maintains a bus system with several routes, generally between Ogden and Provo. UTA also is responsible for the TRAX system, which is light rail running from downtown Salt Lake to the airport, University of Utah and several suburb towns south of town. For both bus and train, one-way fare is $2.50, and a transfer can be obtained upon request, which will allow you to board another bus or train within two hours. UTA also operates Frontrunner, a commuter train, running between Pleasant View, north of Ogden, through Salt Lake City to Provo. Utah's liquor laws are known as one of the more peculiar things about the state. Liquor is sold only in state-owned stores and generally costs more than in other states. Beer contains slightly less alcohol (3.2% alcohol by weight [4% alcohol by volume], as opposed to the standard 5-6% ABV) than the usual brew, which is available in stores and restaurants. "Full strength" beer is available in bars, although not on tap, and liquor stores. Recently, state law changed the previous 1 ounce limit on liquor in mixed drinks to a more standard 1.5 ounces. Secondary alcoholic flavorings may then be added to a mixed drink as the recipe requires. "Happy hours" and other drink specials are not allowed, so prices remain constant regardless of day or time. Keep in mind that driving after drinking is prosecuted aggressively in the state of Utah. For the latest news/changes and for a list of stores see the official website. I grew up and continue to live in Utah for over 60 years now. I've camped and traveled and hiked and backpacked in almost every corner of the state. I've visited all the national parks and monuments many times, and most of the fabulous state parks as well. This is my home, and I'm proud of its history, geography and beauty. This is version 46. Last edited at 10:02 on Sep 6, 17 by Utrecht. 45 articles link to this page.